Thousands of Palestinians participated, on Saturday evening, in the funeral procession and ceremony of Sa’ad Dawabsha who died Saturday of serious burns and injuries resulting from the Israeli terrorist attack on his family home, leading to the death of his baby, Ali, ten days ago. Dawabsha’s body was moved from an Israeli hospital to the northern West Bank city of Nablus, before being sent to his village, Douma, where his funeral and burial ceremonies were held. 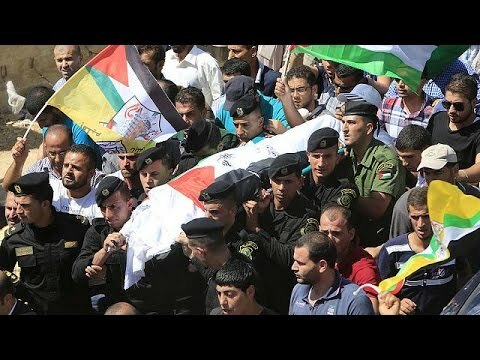 Thousands of Palestinians gathered while the body of the slain Palestinian was on its way to his village, and then participated in the funeral along with dozens of Palestinian political and security leaders, civil-society figures and Arab members of Israeli Knesset. Ali, the 18-month of age baby, was burnt to death in the terrorist attack on his family home, while his mother Reham, 27 years of age, suffered burns to 90% of her body, and his brother Ahmad, 5 years of age, suffered second-degree burns to 60% of his body. Bseiso added, “The Israeli government continues to encourage those crimes by its ongoing incitement, the approval of dozens of thousands of units in its illegal colonies in the occupied West Bank and occupied Jerusalem, and the escalating destruction of Palestinian homes, lands and even entire villages, such as Susiya village near Hebron.